A rainbow of play possibilities comes packed inside these giant crayons. These crayons invite children to peek inside and discover different color-coded figurines for matching, sorting and imaginative play. Includes: 8 cardboard crayons with plastic lids – brown, red, yellow, green, purple, pink, blue, orange, 48 manipulatives total and storage box. Will assist students in identifying the names of colors and objects, learning about quantities, creating sequences, and understanding spatial relationships such as next to, behind, and in front of. It is an ideal way to introduce sorting and grouping. Add more fun by counting as each piece is dropped into a crayon tube or create patterns with the objects to introduce AB patterning. 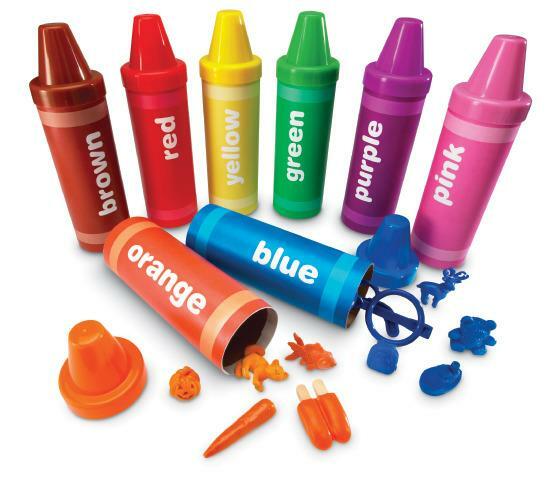 Clean up becomes part of the activity by putting all of the objects into their respective crayons. Dimensions: Each crayon measures: L: 9.5” x 2.5” Dia.